A student walked in the American River College portable cafeteria hauling two rolling backpacks and carrying another on his back into a party. LAN parties are when people bring their computers or video game consoles to a place, in this case the cafeteria at ARC, to host and play multiplayer simulated video games. The players establish a local area network, or LAN, and hook up their gaming systems. Andrew Preston, a psychology major at ARC, started bringing his own Xbox and computer monitor to play games and people enjoyed watching him play. Soon people brought their own equipment and joined Preston. 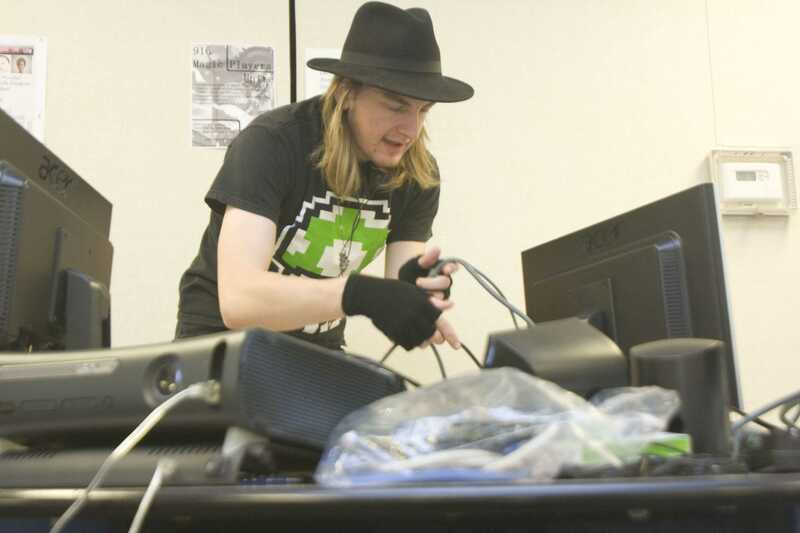 “We run LAN parties essentially all day,” Preston said. There are three different Xbox and PlayStation 3 consoles the players use when gaming. The largest amount of systems hooked up at one time was three, according to Preston. Preston started being involved with LAN parties socially with friends in high school. He started playing on campus this semester. On average Preston said there are usually six to eight players, even though they have the capacity to have as many as 10. There are numerous games students play such “Halo,” “Assassin’s Creed” and the “Call of Duty” series. “Halo” is the favorite among the players at ARC because it has no restrictions when linking players. “You can have four players per system and then link those systems together,” Preston said. He then gave the example of having four systems and four players per system, equaling a total of 16 players. Other players, such as Matthew Sparks, a friend of Preston’s and business management major, take part in the LAN parties. Sparks said a lot of people do not have internet connections at home, so the LAN parties are a good way to meet with friends and play. “It’s a stress reliever,” Sparks said. Playing the games can become quite competitive, although violence has not occurred. Preston says there is always friendly banter, but nothing further. Sparks fully agreed with him. “I get frustrated, but everybody gets frustrated when you spawn and die suddenly, but I don’t get mad, I get even,” Sparks said jokingly. The parties have no time limit other than the operating times of the portables and the players consolidate their space and keep to themselves. They also leave before the cafeteria closes so that there are no problems with getting the students to leave. “I try to make sure I am not too disturbing,” said Preston. Be the first to comment on "ARC students host LAN parties on campus for between-class stress relief"